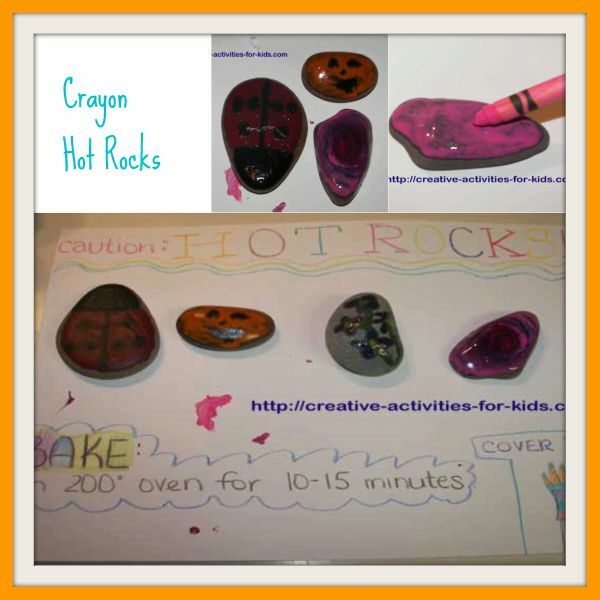 Make some crayon hot rocks! The heat from the rocks melts the crayons which makes a really pretty effect. They are very hot you will want to protect your hand with some gloves. During a hot summer day you can set your rocks in the sun for a few hours instead of using the oven. When it is cold out you bake the rocks and color them with crayons. This is a great summer craft or homeschooling activity. 1. Choose some flat rocks. 2. Set them out in the hot sun for a few hours, until they are hot to the touch. -or- Bake them in a 200 degree oven for 10 minutes. 3. Remove them carefully from the oven, and begin coloring on them with crayon. 4. Please note that the colors tend to run together. 5. Once you are finished let the rocks dry and cool. 6. Seal them with a coat of Mod Podge. 7. These look great in gardens, or as paper weights. If the rocks are light enough you can make them into magnets! Did you like the crayon hot rocks? Try more craft ideas here!